To Cite: Zheng X Z, Yang B, Wu J. Comparison of the Efficacy of Conventional Echocardiographic Parameters in the Diagnosis of Significant Coronary Artery Stenosis, Iran J Radiol. 2015 ; 12(1):e11405. doi: 10.5812/iranjradiol.11405. Background: For diagnosis of significant coronary artery stenosis, the most accurate parameter among the conventional echocardiographic parameters remains unknown. Objectives: To assess the diagnostic efficacy of conventional echocardiographic parameters in the diagnosis of significant coronary artery stenosis and their correlation with the percentage of stenosis considering conventional coronary angiography as gold standard. Patients and Methods: Seventy eight individuals were included in the study. The three echocardiographic parameters including the coronary sinus flow [flow (mL/minute)], the global left ventricular perfusion by dividing the coronary sinus flow by left ventricular mass [flow/LVM (mL/minute)] and the difference between the left ventricular mass at end diastole and peak systole using area-length calculation methods [LV (d-s) mass A-L] were assessed using receiver operating characteristic (ROC) analysis for their accuracy to distinguish between normal subjects and patients with significant (> 50%) coronary artery disease (CAD). Results: Flow (mL/minute), flow/LVM (mL/minuteg) and LV (d-s) mass A-L all correlated significantly with the percentage of stenosis (r = -0.64, P < 0.001; r = -0.47, P < 0.001; r = -0.56, P < 0.001, respectively). With the use of the percentage of stenosis > 50% as the criteria to distinguish patients with or without CAD, the areas under the ROC curve for flow (mL/minute) were 0.75, while they were 0.57 for flow/LVM (mL/minuteg) and 0.59 for LV (d-s) mass A-L. The percentage of stenosis > 70% was best detected by coronary sinus flow < 198 mL/minute (sensitivity, 81.35%; specificity, 70.37%; positive predictive value, 63.63%; negative predictive value, 86.36% and accuracy, 75%; P < 0.001). Conclusions: The coronary sinus flow per minute is the most accurate parameter among the three echocardiographic parameters mentioned above for the assessment of significant stenosis of the coronary artery. The assessment of the coronary artery stenosis by conventional echocardiography remains challenging due to inadequate visualization of the coronary arteries, especially for the mid and distal parts (1-3). As 95% of the left ventricular perfusion drains to the right atrium through the coronary sinus (4), the flow in this vessel is a good representation of the global left ventricular perfusion. Over the last decade, coronary flow reserve in the coronary sinus has been used to diagnose the significant coronary artery stenosis by transesophageal Doppler echocardiography (TEE). TEE is a semi-invasive procedure and the vasodilator drugs, such as adenosine, are not always harmless. A recent study demonstrates that reduced antegrade flow in the coronary sinus detected by transthoracic Doppler echocardiography (TTE) is a sensitive predictor of coronary artery stenosis in hypertensive patients (5). Global left ventricular perfusion calculated by dividing coronary sinus flow by the left ventricular mass (LVM) is another parameter for the assessment of significant stenosis of the coronary artery (6). Moreover, in clinic, we have also found that the difference of LVM at end diastole and peak systole using area-length calculation methods [LV (d-s) mass A-L] correlated significantly with the mean percentage of stenosis in patients with CAD, and the reduced LV (d-s) mass is a sensitive and specific predictor of significant stenosis of the left coronary artery territory (7). The question is “among the three mentioned parameters of coronary sinus flow, the global left ventricular perfusion and the difference of the left ventricular mass in the cardiac cycle, which is the most accurate parameter?” it remains unknown. The purpose of this study was to compare the efficacy of the above mentioned echocardiographic parameters in the diagnosis of significant coronary artery stenosis using coronary angiography as gold standard. Our study was approved by the local human research ethics committee and free informed consent was obtained from all the participants. The study population consisted of 78 participants who had undergone coronary angiography because of suspected CAD. Thirty-eight of these participants were normal participants (mean age, 55.9 ± 10.2 years; range, 45-66 years) and 40 were CAD patients who had more than 50% stenosis in coronary angiography (mean age, 54.9 ± 11.8 years; range, 43-66 years). All the participants had a sinus rhythm, normal systolic function of the left and right ventricles, normal right ventricular systolic pressure, normal right atrial pressure and normal pulmonary artery pressure, which was confirmed by right heart catheterization. The participants with hypertension, congenital heart disease, valvular disease, cardiomyopathy, diabetes mellitus, and intracoronary shunts were excluded from the study. LVM (M-mode) (g) = 0.8 × [1.04 × (IVST + LVEDD + LVPWT)3 – LVEDD3] + 0.6.
where π is the ratio of the circumference of a circle to its diameter, and D is the diameter of the coronary sinus (1). The average value of three spectral and planimetric envelopes was used. Global left ventricular perfusion (mL/minute g) = the flow per minute/LVM (M-mode) (3). Third, the apical two-chamber view was obtained. Left ventricular long axis length at end diastole (LVLd apical) and at peak systole (LVLs apical) were measured from the endocardial boundaries to the middle of the mitral annulus (Figure 2 A and C). Finally, the left ventricular short axis view at the papillary muscle level was obtained. Left ventricular epicardial short axis area at the level of the papillary muscle tips at end diastole (LVAd SAX EPI), left ventricular endocardial short axis area at papillary muscle level at end diastole (LVAd SAX PM); left ventricular epicardial short axis area at the level of the papillary muscle tips at peak systole (LVAs SAX EPI) and left ventricular endocardial short axis area at papillary muscle level at peak systole (LVAs SAX PM) were measured in the order mentioned. Left ventricular mass (area-length) at end diastole (LVd mass A-L) and left ventricular mass (arealength) at peak systole (LVs mass A-L) were automatically calculated by the ultrasonic system (Figure 2 B and D). LV (d-s) mass A-L = (LVd mass A-L) - (LVs mass A-L). Invasive coronary angiography was performed in all participants through the femoral approach within 24 hours of TTE according to the standard method of Judkins (9) using the COROSKOP plus angiographic complex (Siemens AG, Berlin, Germany) and standard catheters and conventional views. Coronary diameter stenosis of > 50 % in coronary angiography was considered as significant (10, 11). The number of coronary arteries with significant stenosis, the localization of stenosis and the maximal percentages of stenosis were determined. Intraobserver variability was assessed in 23 participants by repeating the measurements on two occasions (3 days apart) under the same basal conditions. To test the interobserver variability, the measurements were performed on the same subject by a second blinded observer. Variability was calculated as the mean percentage error, derived as the difference between the two sets of measurements, and divided by the mean observations. Data were expressed as the mean ± SD. The differences between the two groups were tested using an unpaired two tailed t test. Flow (mL/minute), flow/LVM (mL/minuteg) and LV (d-s) mass A-L were compared with the mean percent stenosis diameter by linear correlation analysis. A receiver operating characteristic curve (ROC) analysis was used to compare the performance of these parameters mentioned above in discrimination between patients with or without CAD. Discriminant analysis was conducted in the traditional manner. A value of P < 0.05 was considered statistically significant. Statistical analysis was performed with SPSS version 13 software for Windows (SPSS Inc, Chicago, IL). As shown in Table 1 and Table 2, HR, SBP, DBP, IVST, LVPWT, LVEDD, LVEF and LVd mass A-L did not differ between the normal participants and patients with CAD and among the single-vessel, double-vessel and triple-vessel lesions in patients with CAD. Compared with normal participants, the patients with CAD had significantly greater PP, LVM (M-mode), LVs mass A-L and had significantly smaller Dcs, significantly lower VTI, flow, flow/LVM and LV (d-s) mass A-L (g) (P < 0.05). Compared to patients with single-vessel and double-vessel stenosis, patients with triple vessel stenosis had significantly lower Dcs, VTI, flow, and flow/LVM (P < 0.05). bP < 0.05, unpaired t test, compared to the values of single-vessel and double-vessel CAD patients. Twelve cases were single vessel disease, 16 cases were two-vessel disease and 12 cases were three-vessel disease (Table 2). The culprit coronary arteries where the stenotic lesions were located are shown in Table 3. Sixty-five lesions were more than 50% stenosis and 70 lesions were more than 70% stenosis. The mean percent stenosis diameter in the left coronary artery territory was 68.36 ± 17.97%. Flow (mL/minute), flow/LVM (mL/minuteg) and LV (d-s) mass A-L all correlated significantly with the percentage of stenosis (r = -0.64, P < 0.001; r = -0.47, P < 0.001; r = -0.56, P < 0.001, respectively). Using percentage of stenosis > 50% as the criteria to distinguish patients with or without CAD, the areas under the ROC (AUC) for flow (mL/minute) were 0.75, while they were 0.57 for flow/LVM (mL/minuteg) and 0.59 for LV (d-s) mass A-L (g). The AUC for flow (mL/minute) was maximal, which was far higher than that of flow/LVM (mL/minuteg) and LV (d-s) mass A-L (g) (P < 0.05) (Figure 3). Based on the data depicted above, discriminant analysis of flow (mL/minute) for predicting a significant coronary artery stenosis (> 70%) in patients with CAD was conducted. The best cutoff value was flow (mL/minute) of less than 198 mL/minute) (sensitivity, 81.35%; specificity, 70.37%; positive predictive value, 63.63%; negative predictive value, 86.36%; and accuracy, 75%; P < 0.001). Intraobserver and interobserver variability for flow per minute were 7.3% ± 2.6% and 7.9% ± 2.4%, respectively. Intraobserver and interobserver variability for LVM (M-mode) (g) were 2.5% ± 0.9%, 2.9% ± 1.2%, respectively. Intraobserver and interobserver variability for LV (d-s) mass A-L (g) were 7.2% ± 3.1% and 7.8% ± 2.7%, respectively. The results presented here indicate that the coronary sinus flow per minute is the most accurate parameter among the three echocardiographic parameters: the coronary sinus flow, the global left ventricular perfusion and the difference of left ventricular mass in the cardiac cycle, for assessment of significant stenosis of the coronary artery. A number of myocardial Doppler derived velocity, strain myocardial imaging parameters and speckle tracking imaging and wall motion score index have been proposed for the quantification of myocardial ischemia during stress echocardiography (12-15). But in the routine echocardiographic examination, they all have difficulties in the early detection of the presence of myocardial ischemia to some extent, especially when angina or myocardial infarction has not yet occurred. 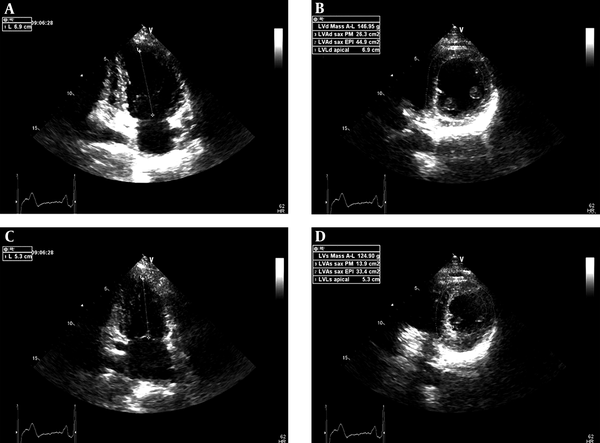 Although myocardial contrast echocardiography is an accurate imaging tool for the assessment of the myocardial microcirculation (16), it is time-consuming, expensive, and it is not always readily available. Alternative methods for the detection of myocardial ischemia are needed. The coronary sinus flow, the global left ventricular perfusion and the difference of left ventricular mass measured by ordinary two-dimensional and Doppler echocardiography, being rapid, convenient, inexpensive, reliable, and noninvasive in the assessment of significant stenosis of the coronary artery territory, has potential for clinical implications. In our study, the average CS flow was determined to be 306.78 ± 120.81 mL/min in normal subjects and 181.38 ± 108.72 in patients with CAD. This is in range with what has been found in previous echocardiographic studies, where values from 250 mL/min (17) to 450 mL/min (5) in normal subjects and from 150 mL/min (18) to 250 mL/min (17) in patients with CAD have been reported. The average value of LV perfusion, 2.51 ± 1.43 mL/minuteg in normal subjects and 1.97 ± 1.14 mL/minuteg in patients with CAD are significantly greater than other published values determined by magnetic resonance imaging, which lie between 0.60 ± 0.22 mL/ming and 0.53 ± 0.14 mL/ming (6, 19-21). Maybe, the different imaging methods are accountable for these differences. The average value of the difference of left ventricular mass in the cardiac cycle, 39.95 ± 18.47 g in normal subjects and 22.91 ± 17.14g in patients with CAD, is also in accordance with published values, which is 40.12 ± 14.37g in normal subjects and 21.36 ± 17.55 g in patients with CAD (7). In our study group, flow (mL/minute), flow/LVM (mL/minuteg) and LV (d-s) mass A-L all correlated significantly with the percentage of stenosis of the left coronary artery territory. Using a percentage of stenosis > 50% as the criteria to distinguish patients with or without CAD, the areas under the ROC curve for flow (mL/minute) were 0.75, while they were 0.57 for flow/LVM (mL/minuteg) and 0.59 for LV (d-s) mass A-L. 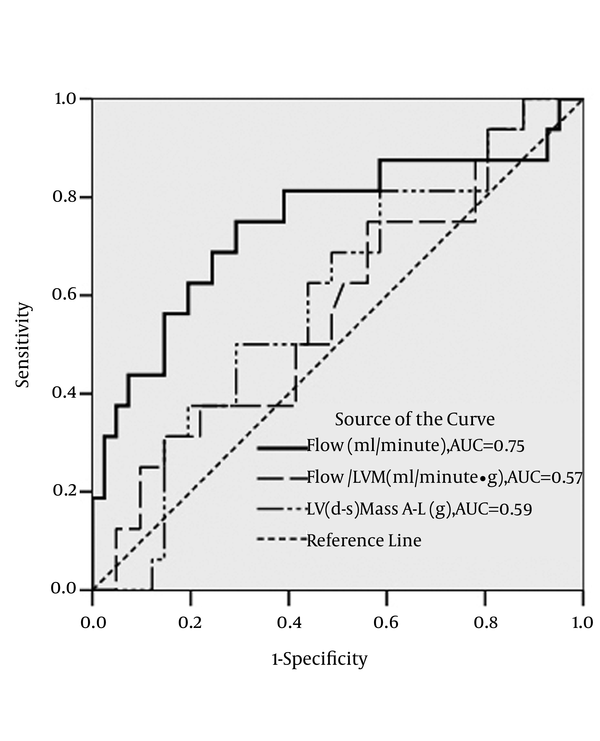 The AUC for flow (mL/minute) was maximal, which indicated that flow (mL/minute) has the greatest ability to distinguish patients with or without CAD. The following factors can account for this result. First, LVM as measured by M-mode and two-dimensional echocardiography has inherent defects, which assume left ventricular as a prolate ellipsoid shape (22). Formulas were developed for the calculation of LVM based on the regression equations of the calculated mass to autopsy findings. Some limits, such as non-standard left ventricular long or short axis view, unclear epicardial or endocardial boundaries, and the poor acoustic windows, all affect the accuracy of the measurements. 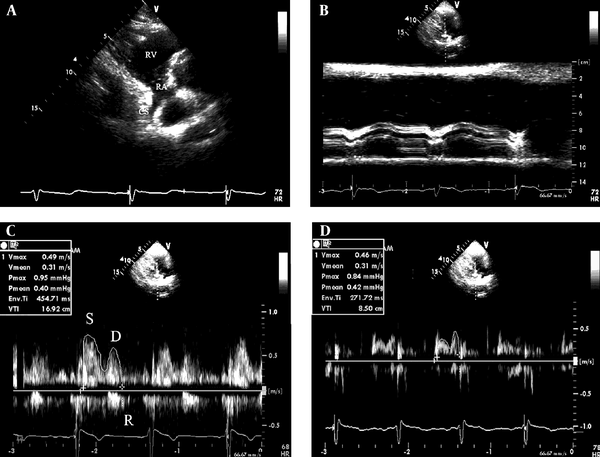 However, coronary sinus can be adequately visualized from the parasternal right ventricular inflow tract view through TTE approach in almost all subjects, and the coronary sinus flow in this view can be monitored by TTE within a distance of 1 to 1.5 cm from the ostium with a < 30° Doppler angle between the ultrasound beam and the vessel. Although sometimes some limitations such as the interference of the heart movements and the poor acoustic windows also exist, the coronary sinus flow can more directly reflect the homodynamic changes of blood flow in the left coronary artery territory than the global left ventricular perfusion and the difference of left ventricular mass in the cardiac cycle. In this study, we ranked the echocardiographic parameters: the coronary sinus flow, the global left ventricular perfusion and the difference of left ventricular mass in cardiac cycle vs. coronary angiography as gold standard for the assessment of significant stenosis of the left coronary artery territory. We demonstrate that the coronary sinus flow per minute is the most accurate one among these parameters. Although some limitations have been mentioned above, this method still holds considerable clinical promise for the diagnosis of CAD. The authors gratefully acknowledge the technical assistance and helpful discussion of Li J, Huang XQ, Fan GX at the department of ultrasound, The First People’s Hospital of Yancheng, Jiangsu Province, P.R. China. Authors’ Contributions: Bin Yang and Xiao-ZhiZheng developed the original idea and the protocol, abstracted and analyzed the data, wrote the manuscript, and is guarantor. Jing Wu contributed to the development of the protocol, abstracted data, and prepared the manuscript.